Medical Officer, Counsellor, Staff Nurse, OST Medical Officer, Technical Supervisor, Counsellor of Blood, Counsellor of BCSU, Lab Technician for Blood Bank, B.T. Van Driver and Mobile ICTC Driver Jobs. As per Notification, total Available Vacancies are 66. Application mode is Offline. Job location is Purulia District, West Bengal. Closing date to send completed Application forms is 16th January, 2017. For Counsellor, ICTC Counsellor, ICTC Lab Technician selection will be through written test and oral test. 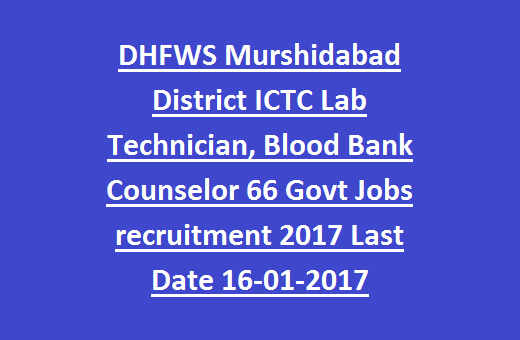 All details of DHFWS Murshidabad District Counsellor, Medical Officer Jobs Recruitment Notification mentioned below. As per Notification, total Available Vacancies are 66. For Counsellor, ICTC Counsellor, ICTC Lab Technician, Staff Nurse Rs.13000/- per month. For Senior Medical Officer, Rs.45000/- per month. For Medical Officer Jobs, Rs.36000/- per month. For OST Medical Officer, Rs.25000/- per month. Please go through Official Notification for remaining Job details. For ICTC Counsellor, ICTC Lab Technician Jobs Qualification must be post graduation degree or diploma in relevant discipline. Senior Medical Officer Jobs, MD or MBBS + diploma. For Medical Officer, MBBS trained by NACO. Please go through Official Notification for remaining Job details. For Counsellor, ICTC Counsellor, ICTC Lab Technician it will be through written test (85 marks) and oral test (15 marks). For Technical Supervisor, Counsellor of Blood Bank Jobs Selection will be through written test (70 marks), Academic (10 marks), Experience (10 marks), Personal Interview (10 marks). Please go through Official Notification for remaining Job details. Download Application forms from Website and send duly filled Application form along with relevant documents to below Address on or before due date of 16th January, 2017 (Monday) through registered post or speed post or courier only. Cantonment Road PO Berhampore Murshidabad.